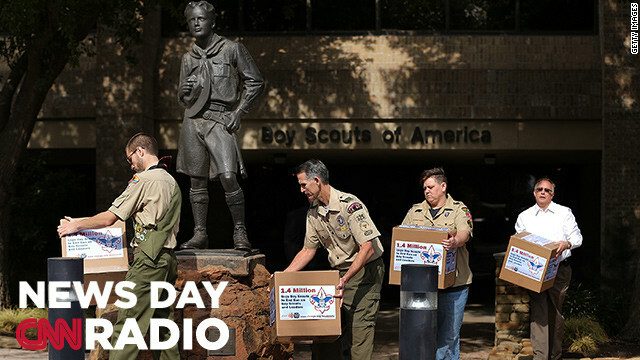 Irving,Tx - February 04- Will Oliver, Eagle Scout , Greg Bourke, former Assistant Scoutmaster, Jennifer Tyrrell, former Cub Scout Den Mother, and Eric Andresen, former Scout leader, deliver boxes containing 1.4 million signatures urging the Boy Scouts of America to reverse the organization's ban on LGBT Scouts. "Say that there is, you know, someone who has a crush on another boy and would want to flirt with him. I don't think that it should be such an awful thing for a straight boy to have to endure..."
"Some people have said to me, 'Why don't they just put gas in there?' Well, if you recall back a number of years ago in the Soviet Union, there was a hostage taking in a theater. And they pumped gas in there and a number of people were killed, because you don't know different people's tolerances." "They may well choose to melt away over the border into Algeria or Niger looking for other ungoverned spaces from which to launch an insurgency against the forces deployed in northern Mali." The Boy Scouts of America has a LONG history of being a MORAL, religious organization. NO, they should Not end the ban on Gays. One, Gays amount to such a Trivial amount of the population, why do they have such a large say in things? Majority rules... Two, the Bible says they are an Abomination, do not let them sit at your table, do not associate with them!!. enough said. I don't want some gay man camping in the wilderness in tents with my boys. Not to mention it is sending the WRONG message to my boys that being gay is o.k... IT IS NOT. I don't care what is "Politically correct" or not.. being gay is Sick..distrubing..unnatural AND goes against my religion!